Chuck Sudetic, author of Blood and Vengeance: One Family’s Story of the War in Bosnia and co-author of Madame Prosecutor: Confrontations with Humanity’s Worst Criminals and the Culture of Impunity. 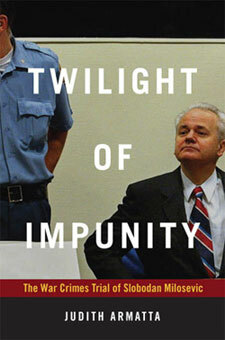 An eyewitness account of the first major international war-crimes tribunal since the Nuremberg trials, Twilight of Impunity is a gripping guide to the prosecution of Slobodan Milošević for war crimes, crimes against humanity, and genocide. The historic trial of the “Butcher of the Balkans” began in 2002 and ended abruptly with Milošević's death in 2006. Judith Armatta, a lawyer who spent three years in the former Yugoslavia during Milošević's reign, had a front-row seat at the trial. In Twilight of Impunity Armatta brings the dramatic proceedings to life, explains complex legal issues, and assesses the trial’s implications for victims of the conflicts in the Balkans during the 1990s and international justice more broadly. Armatta acknowledges the trial’s flaws, particularly Milošević's grandstanding and attacks on the institutional legitimacy of the International Criminal Tribunal. Yet she argues that the trial provided an indispensable legal and historical narrative of events in the former Yugoslavia and a valuable forum for victims to tell their stories and seek justice. It addressed crucial legal issues, such as commanders’ responsibility for crimes committed by subordinates, and it helped to create a framework for conceptualizing and organizing other large-scale international criminal tribunals. The prosecution of Slobodan Milošević in The Hague was an important step toward ending impunity for leaders who perpetrate egregious crimes against humanity. Click here to download and print an order form for Twilight of Impunity.